You already know that health care and health insurance are changing rapidly these days. And whether you’re a long-time Blue Cross and Blue Shield of North Carolina member or you’re enrolling in a BCBSNC plan for the first time, you’re bound to have questions about your coverage. What you may not know is that many questions we receive through our customer service phone lines could be answered instead with a few mouse clicks. 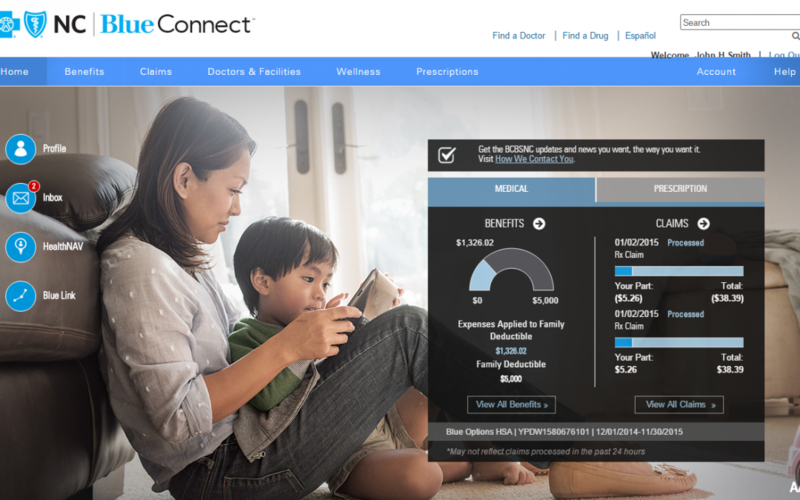 If you’re already a BCBSNC member, you can visit our Blue Connect member portal to access our online resources. You could also send a secure message to BCBSNC via the Blue Connect inbox. BCBSNC members with individual plans can have a live chat with one of our customer service representatives (during normal business hours). Here are a few of the most frequent questions from callers to our customer service center, many of which could be answered online instead, without having to compete with the volume of calls to our customer service team. I haven’t received my ID card and I need to see the doctor. What can I do? 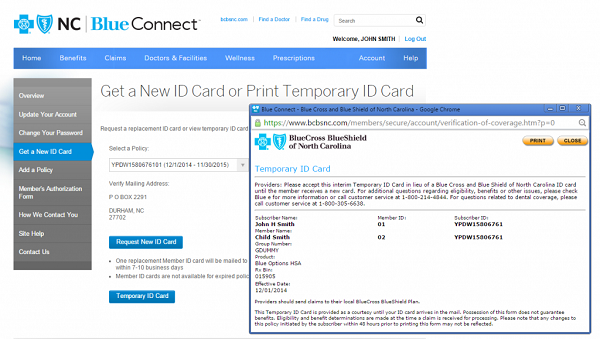 If you are already a BCBSNC member who’s renewing coverage, you can print a temporary ID card through our Blue Connect member portal. You can present that temporary card to your doctor while you await your ID card in the mail. It should take 7-10 days after your first payment to receive your ID card in the mail. If you’re a new BCBSNC customer, you can print a verification of coverage from our website 5 days after making your first payment. If you bought your policy from the federal marketplace, your ID card may take a few days more than the standard 7-10. What’s my co-pay? What’s my deductible? What’s my out-of-pocket maximum? What’s my prescription co-pay? After Jan. 1 when your 2017 coverage goes into effect, you can find all of these details about your specific plan on Blue Connect. You can also check on the status of a claim, view a summary of benefits and find a host of health and wellness resources that can help lower your spending on health care. If you’re not a current BCBSNC member and you’re shopping for a health insurance plan, visit our website to look over our selection of health plans for individuals and families. How can I find a doctor who’s in-network? Just visit our Find a Doctor page and follow the prompts. Where can I get a list of pharmacies? How can I find out if a particular medicine is covered? You’ll find answers on our Find a Drug or Pharmacy page. Customers enrolled in our Blue Value, Blue Select or Blue Local health plans can visit our website to find pharmacies that are in-network for 2017. Locations are listed alphabetically by city. I’m a new BCBSNC customer. How can I make my first payment? You can make a payment through our website. The page will allow you to confirm your subsidy amount before making a payment. I’m a returning BCBSNC customer. How can I pay my monthly premium? It’s easy to make sure you stay current in your premiums through Blue Connect. You can even set up monthly auto-payments by bank draft or credit card. If you have other questions, we are here to help. We look forward to serving you!